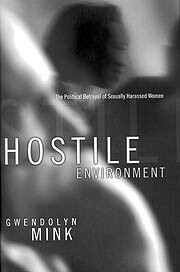 In her new book, Hostile Environment: The Political Betrayal of Sexually Harassed Women, political scientist Gwendolyn Mink warns that despite great strides in the development of sexual harassment law, the political and social costs of actually using the law silence sexually harassed women in all but the most egregious cases. In today's climate, women are subjected to what Mink calls a "regime of disbelief" that surrounds sexual harassment: Their credibility is questioned, their motives are considered suspect, their morality is trampled, and their personal lives are often exposed and defamed. "The treatment of women in recent high-profile cases sends a message to women about what's in store for them if they come forward," said Mink, a professor of politics at UCSC. "We must make it possible for targets of sexual harassment to speak up by insisting on a process and a social context that respects the validity of their claims." From the start, the regime of disbelief tainted Paula Jones's case against President Clinton, when Jones was immediately maligned as a "trailer-park floozy" looking for a book deal. As the Monica Lewinsky scandal jeopardized Clinton's presidency, the president's defenders not only disparaged Jones but denied that what she said Clinton had done to her was sexual harassment at all. Mink expressed her views on the opinion pages of the New York Times and through other media channels during the Jones case, but she notes that she makes no judgments regarding the veracity of Jones's claims. "During the case, I had no grounds for knowing what to believe, and neither did the people who insisted Jones was telling a lie," said Mink. "What's important is the fairness of the legal process to somebody who tries to avail herself of a civil rights remedy." Sexual harassment can take different forms, from physical contact to verbal harassment to leers. Current estimates are that close to half of all women will experience sexual harassment in some form during their working lives. It first catapulted to the forefront of the nation's attention with Anita Hill's allegations against then-Supreme Court nominee Clarence Thomas. "The regime of disbelief has existed for every woman who has tried to make a claim, but we didn't collectively witness the regime in action until we all watched it work against Anita Hill," said Mink. "The core problem with the regime of disbelief is how political it is," added Mink. "In every case, high-profile or not, political judgments are made about the veracity of the claim depending on partisan alliances, moral assumptions, and the relative power of the alleged perpetrator. Friends of harassers breed doubt." In her book, Mink charts the history of sexual harassment as a legal concept, corrects many common misconceptions about the law, and recounts her own experience of a sexual harassment grievance as a graduate student. Firsthand knowledge of the injuries caused by sexual harassment--and by complaining about it--has contributed to Mink's advocacy on behalf of sexually harassed women. "When you see how poorly targets of sexual harassment are treated, it's not hard to see the inhibiting effect the climate has on other women," said Mink, who was so disheartened by her own experience seeking redress as a graduate student that she decided to do nothing years later when she encountered harassment as an untenured professor. "It took place within my profession, although not at my place of employment, and I knew what I was in for," she recalled. "I just couldn't face it." Recent U.S. Supreme Court decisions on sexual harassment have fallen on both sides of the mark, said Mink, who is not optimistic about near-term legislative efforts to bolster sexual harassment law. "Recent events showed that laws are useless if they operate in the regime of disbelief," she said. "The regime of disbelief can't be legislated away, but individuals can help to dismantle it." Mink urged people to scrutinize their own reactions to public cases, to learn about the law and about how sexual harassment interferes with women's opportunities and abilities to do their jobs, and to ensure that their workplaces have appropriate procedures to handle complaints.